In 2006, a locally wet spring on the heels of a statewide wet year in 2005 resulted in an active landslide season in northern Utah. Nearly all of the 2006 landslides were reactivations of pre-existing landslides, including slides that had previously moved sometime during the past decade. The following are some of the landslides UGS geologists investigated to assist local governments with their emergency response. Around 9:30 p.m. on Sunday, April 9, a rapidly moving landslide in South Weber broke through the back wall of a house at 7687 South 1650 East, injuring a child inside. 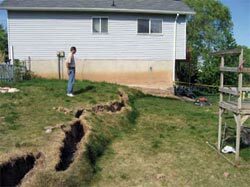 The landslide started on a steep slope near a pond in a gravel pit atop a bluff behind the house. 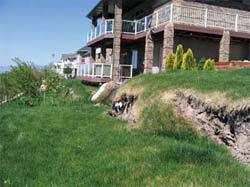 Subsequent investigation found evidence of subsurface water flow from the pond to the slope. Water seepage and saturation of materials on the bluff top likely triggered the landslide, but the steep slope, the weight of fill placed on the top of the slope, and weak underlying geologic materials were contributing factors. Also, a major rain and snow storm on April 4 through 6 dropped approximately 2 inches of water, likely causing surface and subsurface water levels to rise. After the landslide, the pond was drained to reduce further landsliding. The 1650 East landslide and a nearby similar one that demolished a barn and blocked South Weber Drive (State Route 60) in 2005, demonstrate the destructive nature of rapidly moving landslides and the risk of building at the base of steep slopes. Homeowners along Sunset Drive in Layton recognized in mid-April that the Sunset Drive landslide had reactivated. 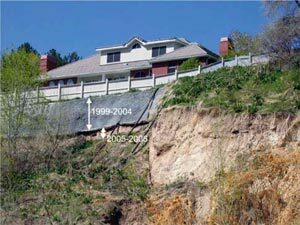 In 1998, landslide movement damaged seven lots and resulted in a house having to be condemned and demolished. The 2006 movement affected six lots, including two houses. The house at 1843 East Sunset Drive straddles the main scarp, and landslide movement has removed support from beneath part of the foundation. Layton City building inspectors found the house unsafe for occupancy due to structural damage, and it may be moved off the landslide to another location. UGS geologists measured a 4- to 8-foot increase in ground-water levels in and near the landslide between March 16 and April 17, which apparently triggered movement. The 2006 peak ground-water level is a threshold that can be used to predict future landslide movement. The Beechwood Drive landslide is a quarter- mile south of the Sunset Drive landslide and reactivated at about the same time. The Beechwood Drive landslide is a reactivation of a pre-existing landslide with no documented historical movement. The landslide main scarp cuts across the back of five lots and has damaged landscaping in backyards. The landslide also affected the upper part of the proposed Beechwood subdivision phase 6 development. Both the Sunset and Beechwood Drive landslides show how prone some slopes in Layton are to landslide movement. In 2005, three landslides formed in the Creekside Drive area of Mountain Green in Morgan County, in a northeast-facing slope underlain by pre-existing landslide deposits. In 2006, the three landslides re- activated, and two new landslides formed nearby. Continued movement of the largest of the five landslides forced the evacuation of a severely damaged house at the top of the slide, and damaged two others. Damage also occurred to Creekside Drive and utilities beneath the road, disrupting the power and water to the affected subdivision. Despite favorable subdivision-wide and lot-specific geotechnical studies, landsliding occurred within only a few years of development on the pre-existing landslide deposits. 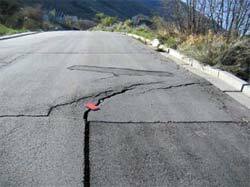 Stabilization of the landslides, particularly the largest one, will likely prove costly and technically challenging. The Sherwood Hills landslide in northern Provo is one of several in northern Utah that has undergone repeated movement over the past 25 years. 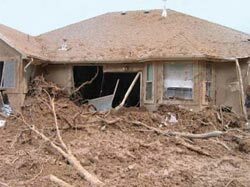 Damage to houses and roads caused by renewed landslide movement was first documented in the early 1980s. The landslide has been systematically monitored since May 1999 when Provo City established survey points on the slide and began using high-precision Global Positioning System survey techniques to measure movement. The survey results suggest that the landslide remained active even during the drought years between 1999 and 2004. With the return of wetter-than-nor- mal conditions in 2005, the rate and area of landslide movement increased. By 2006, three houses in the upper part of the landslide had been abandoned, including one built in 2000, and a road had been severely damaged. Some data suggest that landslide movement is continuous, slowing in the summer to an undetectable rate, and increasing in the late winter and early spring as groundwater levels rise during the snowmelt. The continuing losses due to movement illustrate the potential high costs, both public and private, associated with development on large pre-existing landslides. A cluster of historical landslides is visible from the hairpin turn in Bonneville Boulevard in lower City Creek Canyon in Salt Lake City. Movement of the largest and most damaging of these landslides has been monitored since June 1998 by the UGS and the Salt Lake City surveyor. Since June 1998, the toe of the landslide has moved about 24 feet, and the main scarp has offset the ground surface about the same amount. Like most recurrently active landslides in northern Utah, movement typically occurs between March and June as ground-water levels rise following the snowmelt. Four houses at the top of the slide are threatened, and efforts to protect one house have cost in excess of $300,000. 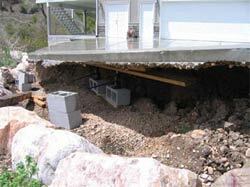 In 2006 the landslide reactivated again, moving about 2 feet, despite drier-than-normal conditions in Salt Lake City.